For ten years, Karla and Kio have known nothing but Nashido–the castle, floating thousands of feet above a vast ocean, that protects them with a combination of unreliable technology and unfathomable magic. Every day, they tend the massive vines that produce the oxygen they breathe, hunt birds for dinner with spring-loaded spears, and charge the castle’s engine battery by steering through lightning storms. They don’t remember much about when there were other people on Nashido, and the parts they do remember, they don’t talk about. Ever. One thing keeps them going: Raven, an ornithopter they’re patching together in the hope of one day reaching the surface. Both of them have promised that they’ll set out for land together, or not at all. But then a skeletal winged beast attacks the castle without warning, reminding Karla and Kio how little they know about their flying prison…or about one another. 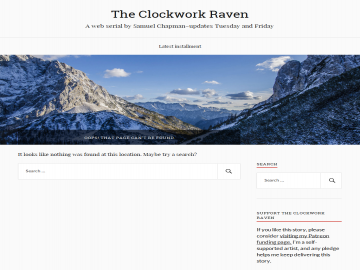 It might be a little early for a full review of The Clockwork Raven--as of my writing this, five chapters are up, and while the titular raven has been alluded to, it hasn't actually appeared. The Clockwork Raven has not been recommended yet.